For information booklet click here. 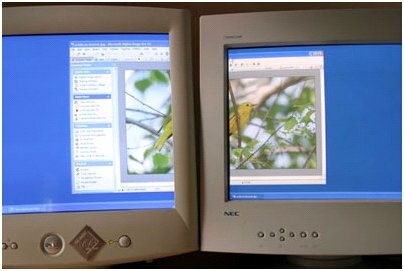 Extract from Microsoft ("Two monitors are better than one," 2009): You can never have enough screen space, especially when organizing and working on your digital pictures. Instead of buying a larger monitor, if you're using Windows 7, Vista, or XP, you can buy an inexpensive second monitor and connect it to your computer—instantly doubling your desktop space. Flat panel LCD monitors look great and will save room on your desk; CRT monitors also work well and can be less expensive. There are several different ways you can make use of this extra screen space when working at home or in your office. If you take a lot of digital pictures, some of the advantages to having dual monitors at your work space include: When browsing your picture library, you can view the thumbnails on one monitor, and use the second monitor to view pictures full screen to check for proper focus and image quality. When editing photos, you can use one monitor to browse the pictures with Windows Explorer or a photo library program, and use the second monitor to edit the pictures with your photo-editing software. If you need to stay on top of your e-mail while working, you can keep your in box open on one monitor and work on your photos on the other.